Imagine a world where an attack on the freedom of the press creates a media printing of epic proportions. On Wednesday, "Charlie Hebdo" will boost its circulation from a weekly 60,000 to 5 million copies in 16 languages and 25 countries, including Turkey, where Hebdo's editor-in-chief says secularism is under attack. It has been a horrific year for journalists. As long as reporters have done their work, people have tried to stop them from doing it; but the dangers of the profession have been especially apparent this year. In Iraq and Syria, the Muslim extremist group ISIS has captured and executed journalists in horrific fashion, starting with the beheading of James Foley. The Committee to Protect Journalists says that 42 journalists have been killed this year alone; last year, 211 were jailed. CNN’s Christiane Amanpour, who hosted this year’s awards ceremony on Tuesday, spoke this week with two of the honorees – Mikhail Zygar, a Russian journalist struggling to keep the country’s only intendant TV news station on the air, and Siamak Ghaderi, who served four years in an Iranian prison and received 60 lashes for his work. Saudi Arabia could have a role in hostage negotiations with ISIS militants, former U.N. hostage negotiator Giandomenico Picco told CNN’s Christiane Amanpour on Tuesday. Picco conducted many high-profile negotiations in Lebanon that led to the release of several Western hostages in the late 1980s and early 1990s. He told Amanpour that if asked to engage in open talks with the terrorist group, he would have a “conversation… with somebody in Saudi Arabia”. Governments tend to ask desperate families to stay quiet and trust them to get their loved ones back, but John Foley, whose son U.S. journalist James Foley was brutally murdered by ISIS in August, told Amanpour that he and his wife Diane Foley regret having remained silent. It is the scandal that has shaken Britain to its core, embroiling the political elite, the police and the press. Allegations that British journalists hacked into phones and computers, and were involved in bribery, forced media tycoon Rupert Murdoch to shut down the country’s best-selling newspaper and resulted in the conviction of Andy Coulson, a former newspaper editor and top aide to Prime Minister David Cameron. “It begins with the crime in the newspapers,” Nick Davies, the reporter who uncovered the hacking scandal, told CNN’s Fred Pleitgen, in for Christiane Amanpour, on Thursday. Members of the press gathered outside a heavily guarded Cairo courthouse Thursday as three al Jazeera journalists jailed in Egypt appeared in court for the first time since their arrest. 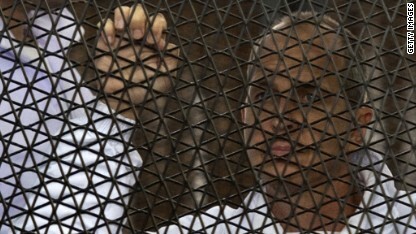 Peter Greste, Mohamed Fahmy, and Baher Mohammed were brought before a judge in a cage. While the court was in recess, they shouted messages to other journalists to pass on to their families. The three men were detained more than 50 days ago. The Egyptian government accuses them of joining or aiding a terrorist organization, the Muslim Brotherhood, which they have categorized as such. Journalists around the world have staged protests demanding their release. All three have pled not guilty to the charges against them. A number of other al Jazeera staff not present in the court today were also charged by the Egyptian authorities. One of them is Sue Turton, a reporter for the network. Click above to watch Turton speak with CNN’s Hala Gorani, in for Christiane Amanpour. The first five weeks of photographer Jonathan Alpeyrie’s captivity among Syrian rebels were the most difficult. “They would force me to wrestle with them, to show me how tough they were, and they snapped my ribs on the right so I couldn’t breathe for a while,” he told CNN’s Christiane Amanpour on Wednesday. It was “just amusement” to them, he said. At least 29 journalists were killed in Syria last year, and some 60 others abducted. Alpeyrie was kidnapped by an armed rebel group at a checkpoint near Damascus last April. He would be held for 81 days.